I have recently shifted my Windows operating system to the MacOS, but had no idea of operating it. When I had transferred my data from the previous laptop to a new one, I had mistakenly deleted my memorable trip images and emptied the Trash. It was quite shocking and ruthless for me. I am wondering for the simple and easy methods to recover all my photos on Mac. Data losing happens frequently on many users’ MacBook or iMac, which would cause serious loss of both money and time if the deleted Mac photos and files could not be restored. 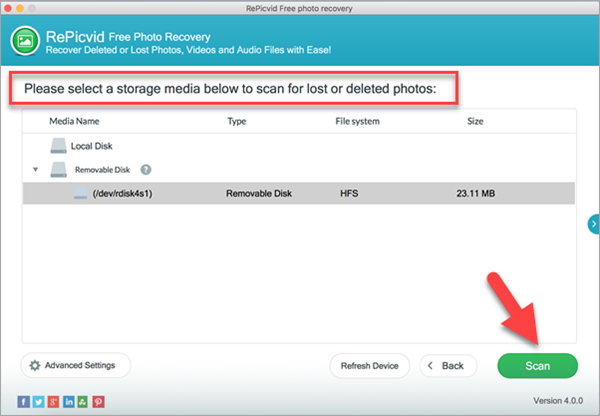 Luckily, in this tutorial, you will learn up to 3 methods to recover deleted photos on Mac free. When you find an important file lost permanently on a Mac computer, the most thing is to stop adding new data on the hard drive of Mac. Otherwise, the lost files will be overwritten, thus impossible to recover. That’s why we put the ultimate Mac file recovery method at the beginning. 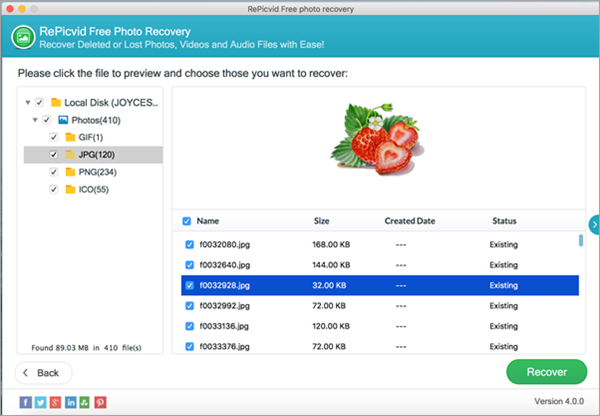 In order to recover permanently deleted photos on Mac, we will need a recovery software for Mac. 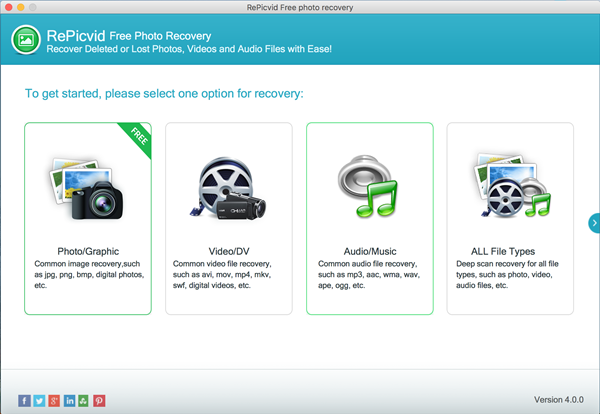 RePicvid Free Photo Recovery is exactly the one in need. It is able to retrieve lost photos, videos and audio files from Mac computer, external hard drive, USB flash drive, memory card and more storage devices. It also works for PC photo recovery. Step 1. Run Mac photo recovery software and choose recovery option. Launch the program, then close the welcome page. Next, choose a recovery option according to which kind of files you want to recover. The program will list all the partitions that it detects, including computer local drives, external hard drive and removable disks. You need to select the partition where you lost the photos. Click Scan to proceed. Once the scanning is finished, you will be able to preview the found files by clicking the file types on the left pane. Just tick all the files you need, then click Recover button to restore deleted Mac files. If you hesitate to choose Method 1, then here is a way confirm if you have really permanently deleted Mac files. If the files were just moved to Trash, you can recover files on Mac free and easily. 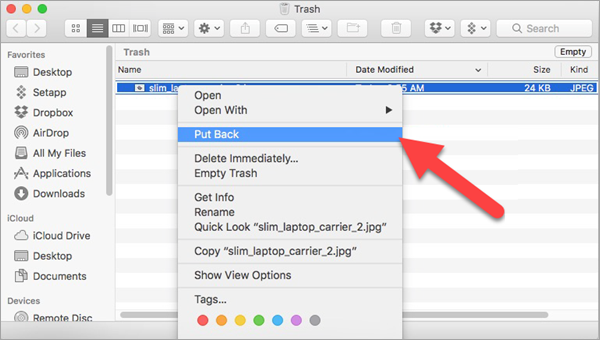 Click on the Trash icon on your Mac. Browse all the deleted files in the Trash to locate the wanted ones. If you couldn’t locate the images from bulk of data, then type their name in the search bar. Right-click on the file you need, then choose Put Back. This method is applicable when you haven’t emptied Trash and the files were not immediately removed and bypassed the Trash. The system may automatically clean files from Trash when the Mac hard drive is full. In Mac OS, there is a repository where a photo is stored for 30 days after deletion. If you are a Mac user, then you can take advantage of this feature. 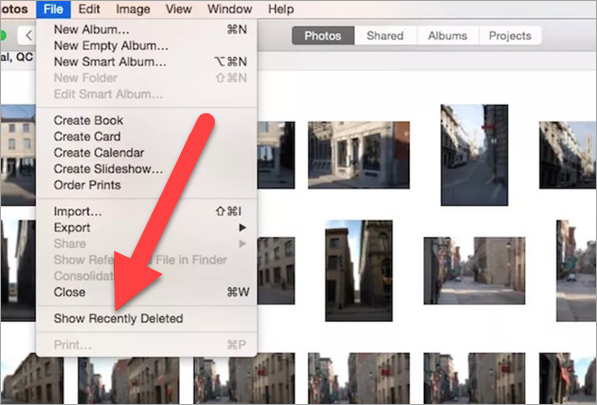 This Mac built-in feature can locate and allow you to restore your accidentally deleted photos. Click on File on the menu. Double-click Show Recently Deleted option. A window will open with the recently deleted photos. 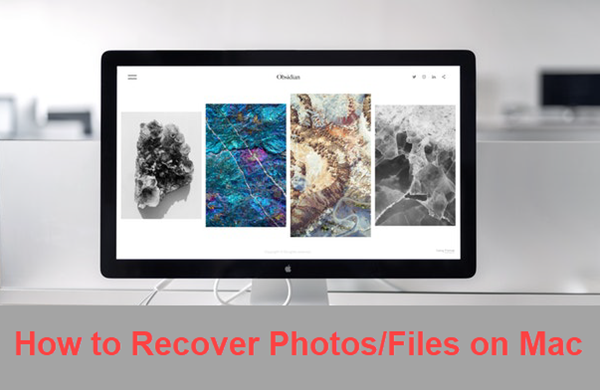 Choose the photos you want to restore, then click Recover button to get them back. Note: The Recently Deleted Album only keeps the data within 30 days. In this tutorial, we have talked about 3 useful methods for undeleting photos and files from Mac computer. Basically, all of them require quick action, but Method 1 will give you more hope and possibility when accident happens. Feel free to tell us if you have any question or suggestion.